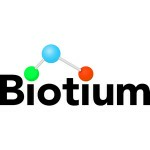 One-Step Protein Gel Stains – from Biotium and Cedarlane! Try Free Samples of One-Step Protein Gel Stains! Try a free sample of One-Step Blue™ and One-Step Lumitein™ Protein Gel Stains! Sample sizes are 25 ml – order today! One-Step Lumitein™ Protein Gel Stain is a ready-to-use luminescent protein gel stain. It is a dramatically improved version of our original Lumitein™ protein gel stain for convenience and safety. One-Step Lumitein™ gel staining requires only a single 5-60 minute staining step without fixation. Destaining is optional. Moreover, One-Step Lumitein™ Protein Gel Stain offers safer handling and ease of disposal, because it is an aqueous-based solution that does not contain hazardous methanol or acetic acid. Furthermore, One-Step Lumitein™ costs significantly less than other fluorescent protein gel stains. One-Step Blue™ is a ready-to-use protein gel staining solution. It produces fast (5-60 min) protein staining in a single step without fixation or washing. Proteins can be detected by visible blue staining, or by near-infrared fluorescence. In addition to rapid results and simple staining, One-Step Blue™ offers safer handling and disposal compared to Coomassie staining because it is entirely aqueous-based, without hazardous methanol or acetic acid.